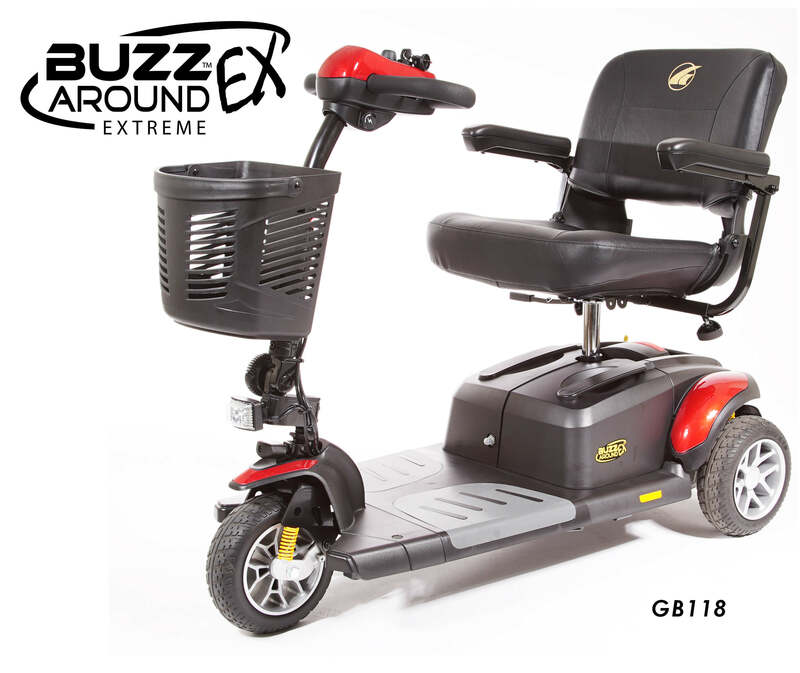 The BuzzAround EX 3-Wheel Travel Scooter is a perfect mix of indoor maneuverability and outdoor dependability. Powered by 2 U1 Batteries, the EX has a range of up to 18 miles between charges and a generous 330 pound weight capacity. Standard with an ergonomically comfortable Delta Tiller, you can ride your BuzzAround EX for extended periods of time without the fatigue that other scooters can cause in your arms and hands. The BuzzAround EX 3-Wheel Travel Scooter is a perfect mix of indoor maneuverability and outdoor dependability. Powered by 2 U1 Batteries, the EX has a range of up to 18 miles between charges and a generous 330 pound weight capacity. Standard with an ergonomically comfortable Delta Tiller, you can ride your BuzzAround EX for extended periods of time without the fatigue that other scooters can cause in your arms and hands. The patented Comfort Spring Suspension smooths the ride over rougher and uneven terrain making this the perfect model for use both indoors and out. Quick and easy disassembly makes traveling with your BuzzAround EX convenient even without a lift.